3. Cotes du Rhone Villages + village name. These classifications simply narrow down the region the grapes came from. Don’t assume a higher classification always means it’s a better wine! You have to judge the wines yourself. We’ve tried plenty of $12 CdR that we liked better than $25 bottles. These wines are often smooth and have a nice, sometimes spicy fruit flavor. They drink well on their own or with meals. We like to have CdR with every day meals and save the nicer CdP etc. for bigger dinners. You may run into some CdR from warm vintages that are overly alcoholic or jammy…however with the average bottle being between $10-$20 don’t be afraid to try something new. You will often times find CdR made by the same producer as a higher quality wine and this Perrin Reserve is a great example. The Perrin family also owns Chateau Beaucastel which is a world class producer of Chateauneuf du Pape. The grapes in the CdR may not have made the cut for CdP but should still be excellent at a much more affordable price. Take a good look at your labels when searching for quality CdR and you’ll increase your chances of finding a good one. colonelgrape: 91. A solid example of CdR. Solid fruit flavor with a little kick. Smooth drinking for any situation. MobyGrape: 88. Smooth with a little winey finish. Fine to drink on its own or a normal meal, save the good stuff for a steak or boozing alone. Next time you’re at the wine rack take a look at the France/Rhone section and grab a bottle of CdR! 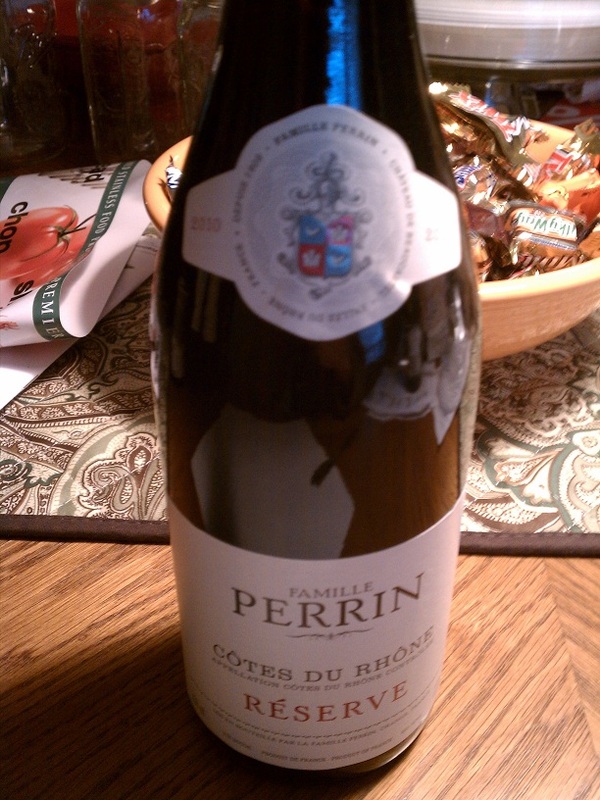 This entry was posted in Cotes du Rhone, France, Grenache, Mourvedre, Rhone, Syrah on November 20, 2012 by colonelgrape.